Rangitoto is a volcanic island in the Hauraki Gulf, close to Auckland in New Zealand. Around 600 years ago it emerged and erupted from the sea, making it the area’s youngest and largest volcano. Although there is a lack of vegetation, Rangitoto is home to the world's largest forest of pōhutukawa trees, a tall evergreen with stunningly vibrant red flowers. The tree plays an important role in local culture due to its beauty and ability to survive in harsh conditions. The island has a tumultuous past, the Māori used it as a lookout over the Gulf in times of war but sold it to the Crown in 1854. It was also the scene of a bloody battle between two tribes hundreds of years ago, giving it the name ‘Rangitoto’, which is Māori for ‘bloody sky’. It was also used as a military base during the Second World War due to its proximity to Auckland Harbour, with a number of fascinating remains still visible today. There are two concrete gun placements, a fire command post and a controlled mine base which was used to detonate bombs in the Whangaparaoa Passage when enemy ships sailed past. The island offers great scenery for walking as well. You can hike up to the peak in about an hour or you can organise a 4WD guided tour if you prefer. The summit offers sublime panoramic views, so don’t forget your camera. There are no shops on the island, so remember to bring plenty of water and sun protection. 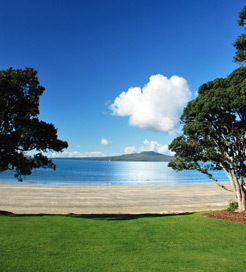 There are two ferry routes from the mainland which arrive on Rangitoto’s east coast. There are a few crossings every day from Auckland Harbour and slightly less frequent crossings from Devonport, on Auckland’s north shore, with both journeys lasting around twenty-five minutes. For more information, please visit our Ferries from New Zealand to Rangitoto Island page.